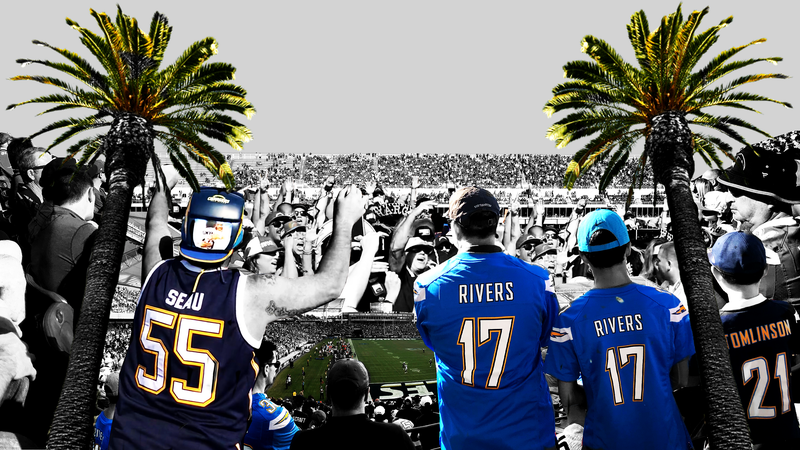 Can Los Angeles Ever Love The Chargers? CARSON, Calif. — I had been in Los Angeles for less than 12 hours, and the first indication I got that the Chargers even existed was when two dudes at a breakfast diner overheard me talking to a server about why I was in town, which was to write a story about the Chargers. “Aw, nobody cares about them,” one offered. Two days in Southern California would do little to disprove this assessment. The Chargers won 12 games this season, which tied for the best record in the AFC. They have a Hall of Fame quarterback in Philip Rivers, one of the league’s few remaining workhorse backs in Melvin Gordon, and a dynamic roster full of young defensive talents like ends Melvin Ingram and Joey Bosa, plus rookie safety Derwin James. They’re in the playoffs for just the second time in the last nine years, with a wild-card game across the country at the Baltimore Ravens set for Sunday. The rest of the nation has noticed the Chargers are pretty damn good. What about Los Angeles? After 56 seasons in San Diego, the Chargers returned last year to L.A., the franchise’s very first home. Only they have no roots here because they spent just one year in L.A., their inaugural AFL season of 1960. The Chargers are basically homeless in their own city. They moved here because owner Dean Spanos couldn’t get San Diego to buck up for a new stadium. San Diego fans said their goodbyes, only to have the Chargers torture them by sticking around for another year. By the time the Chargers finally shoved off, they were second in line as L.A. transplants, following the Rams, who have a real history here that originally spanned from 1946-95. As a result, the Chargers will be the Rams’ tenants when a new stadium opens in nearby Inglewood in 2020. Until then, the Chargers are reduced to playing their home games in a 27,000-seat soccer stadium that was built for the L.A. Galaxy, in front of mostly visiting fans. I was curious to see what this was like. I was pleasantly surprised to discover the Chargers still have plenty of passionate fans. There just aren’t very many of them, and there aren’t a lot of reasons to think that will ever change. Until Jan. 1, the Chargers’ stadium was named for a ticket re-seller. Those naming rights now belong to a non-profit hospital consortium. Say this for the place: It’s accessible (even if, for locals, it’s far enough from the city to seem like it’s in Tijuana). Situated in Carson, some 20 miles south of downtown L.A., the stadium is adjacent to three separate highways, in a largely residential neighborhood. L.A. is spread out and the traffic is as hellish as anyone who’s been here will tell you it is, but on a Sunday morning the drive down from my hotel in Hollywood was a breeze. After reaching Carson and exiting Interstate 110, I was driven down a residential street of ranch houses, only to suddenly stumble upon the Chargers’ home. Unlike most NFL stadiums, which are behemoths, the Chargers’ isn’t noticeable at all until you get right up to it—a metaphor for their status in their new host city. I headed straight for Thunder Alley. Thunder Alley, from the outside looking in. The Bolt Pride Brotha gears up for another game. Williams, who said he works for the federal government, said he gets to maybe four Chargers home games a year, plus the occasional away game or two. He used to fly out all the way from the East Coast, but he moved to Northern California a few years ago. He’s already got season tickets for when the new stadium opens. He’s also got no connection to San Diego—a theme I kept hearing from Chargers fans I talked to that day, even though I certainly didn’t come close to polling every one. As kickoff neared and the stadium filled up, it became apparent that Chargers fans would be outnumbered, as they have been in the two years since the move. But it wasn’t a total road-game feel; I’d estimate the ratio was 60/40 Broncos fans. From what several people told me, more Chargers loyalists began showing up as this season progressed—and the Chargers kept winning—and there hasn’t been a repeat of the cannon accidentally going off when the stadium gets loud because of the visiting team’s fans, which happened during last year’s home opener. In December 2017, The Ringer’s Kevin Clark declared that there was “no identity” to the Chargers home game he attended. Clark also noticed a sizable number of spectators dressed in neutral team jerseys. “Since Carson is south of Los Angeles, there was some South Bay vibe—that is to say, a lot of sandals and Pennywise songs,” Clark wrote. “But overall, the dominant flavor seemed to be ‘people who purchased tickets to an NFL game.’” By the time I got here 11 months later, that dynamic had changed a bit: The presence of actual fans of both the Broncos and Chargers was unmistakable, with Rivers, Antonio Gates, Junior Seau, LaDainian Tomlinson, and Bosa jerseys among the most popular among the Chargers faithful. Sean Dempsey was there with his 9-year-old son, Colin, who was wearing a powder blue Philip Rivers jersey. The Dempseys were attending their first NFL game. Colin’s a fan because he likes Rivers, and when he was younger he liked the Chargers’ lightning bolt logo and that their nickname begins with the letter ‘C,’ like his own first name. I asked Sean if the move from San Diego bothered him. The Chargers take the field. Another factor working against the Chargers is the cost of tickets, which is far and away the highest in the league, with a reported average price of $199. (The next-highest, the New England Patriots, charge an average of $127, which is a whopping 36 percent less.) Parking can cost as much as $100. These high prices are meant to offset the presence of fewer seats, but they’ve also had the effect of keeping Chargers fans away. Demand from visiting fans, meanwhile, has driven up the cost of tickets on the secondary market, which has only encouraged Chargers fans to sell off the stock they do have. The stadium was just about full on the day I attended a game, but that hasn’t always been the case in the Chargers’ two seasons in L.A. The long-term viability of the Chargers in L.A. was a topic of discussion at the NFL owners’ meetings in October, with ESPN’s Seth Wickersham reporting that the league revised its revenue goal for the team’s first season at the Inglewood stadium down from $400 million to $150 million. Pro Football Talk reported that the Chargers will have a 20-year lease with the Rams at the new stadium, but as Farmer told me, that lease likely has some kind of escape hatch in the event the situation doesn’t work out. Also, part of that reduced-revenue projection stems from the fact that the Chargers intend to charge much less for a substantial number of tickets at the new place. “Each decision throughout this process has been made with the fan in mind, and we think the pricing announced today reflects this fact,” A.G. Spanos, the team’s president of business operations, said in a statement. Translation: The lower prices are designed to entice people to show up. Which might prove to be an issue in a city as notoriously superficial as L.A.
Interestingly, of the fans I talked to—certainly not a comprehensive or even sizable sample, granted—there weren’t any actual L.A. residents. So the current Chargers, until they can (if they can) build up their own local fan base, are relying on people who were already Chargers fans but who weren’t put off by the team leaving San Diego. That can’t be that large a demographic. The timing, in some ways, is fortuitous for the Chargers to win over a sizable portion of L.A. fans. The “crown jewels” of L.A. sports, according to Farmer, are the Dodgers, Lakers, and USC football. USC football had filled the void after the Rams and Raiders departed, in large part because Pete Carroll brought them back to national prominence after a long dry spell. 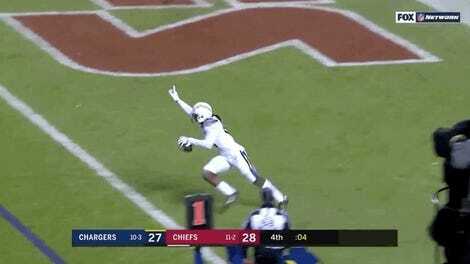 And USC football is down again. But, at the same time, the Rams are one of the most exciting teams in the NFL, with a young quarterback in Jared Goff, a wunderkind head coach in Sean McVay, and recognizable stars like Todd Gurley and Aaron Donald. They’ve earned the NFC’s No. 2 seed and will host a playoff game on Jan. 12. That, plus the Rams’ historical connection to L.A., would appear to give them more of that “crown jewel” credibility. The Chargers, meanwhile, have the worst local TV ratings in the NFL. This season their broadcasts almost always rated worse locally than games involving teams from other markets. And at least once this year, they prepared for a home game by pumping in crowd noise at practice, a tactic teams usually deploy in advance of away games in loud stadiums. Loud cheers went up for both the Broncos and Chargers during pre-game introductions. It was Bosa’s first game back from a foot injury, so the Chargers defense was announced. When Bosa’s name was called, a young boy sitting a few rows in front of me in a Tomlinson jersey pointed at the sky and shouted in unison with the PA person’s call. The Bolt Pride club was being rowdy from its front-row perch behind the north end zone, though they were surrounded by orange-clad Broncos fans. These were fans with a real emotional investment, and there were more of them than I expected to see. At halftime, there was a tribute on the video board to Alex Spanos, who had died in October at the age of 95. Spanos, Dean’s father, became the majority owner of the Chargers in 1984, though he had turned the daily operations of the franchise over to Dean years ago. When the tribute ended, the crowd barely reacted. The Broncos marched up the field and won it at the other end of the stadium on a Brandon McManus field goal on the game’s final play. Their fans let out a loud roar. The young boy in the Tomlinson jersey who had been sitting in front of me was complaining about Rivers’s throwaway, which left Denver with enough time to drive the length of the field. I caught a handful of people making a beeline for the exits before McManus’s kick, no doubt to beat the traffic. But out in the lots, the vehicles were able to pull out rather quickly, without waiting in endlessly long lines. Within minutes, Thunder Alley was practically deserted, which made me wonder how many of those fans even had tickets to the game. The elder Angel Rivera was still there, silently loading his grill into his truck before driving off. It was dusk, and the air was getting cool. Ryan Solorzano, who told me he’s been a season-ticket holder since 2007, was clutching a beer as he wandered from one straggling tailgate to another. Solorzano lives 25 miles down the coast in Huntington Beach—another fan for whom the move from San Diego posed no inconvenience. He was bummed about the loss, and he talked a bit about the perpetual doom of being a Chargers fan, even in good times. He’s somewhat encouraged that more Chargers fans keep showing up for games. I told him I thought the atmosphere—the small stadium, the dueling fan bases—was great. A small shopping center sits directly across the street from Lot 11, right on the corner, and there’s a convenience store there. My phone died, but a store worker kindly let me charge it behind the register for a few minutes. A steady group of fans made their way in to purchase snacks, while others waited outside for car services to whisk them far and wide. It was dark now. A drunken Broncos fan shouted “Mile High California!” at the sight of another Broncos fan as he waited in line at the register. Near the door, the store had a display of hats for sale, a random assortment that reflected L.A.’s transient sports culture: New York Yankees, Houston Astros, Philadelphia Eagles. There were two Chargers hats in the bunch.